Comic Relief? there’s an app for that! Since the first Red Nose Day in 1988, Comic Relief has raised over £600 million and helped change 50 million lives in the UK, Africa and the world’s poorest countries. Bloggers extraordinaire Annie, Penny and Tanya aka Team Honk have been in Ghana on 4 & 5 February visiting four projects funded by Comic Relief, and have been sending individual digital postcards to bloggers back home. The projects include a bakery, vaccination clinic, mental health and slum outreach projects. They kindly agreed to send a postcard to CAppTivated Kids, and it’s here! This photograph is from a vaccine clinic in Accra where we observed mothers taking babies for their jabs at a morning of live media coverage for UK television and radio. 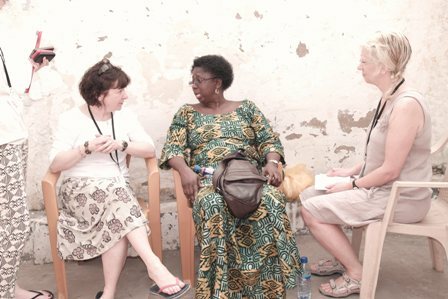 Here Jane Garvey and a producer from Radio 4’s Woman’s Hour interviews a representative from the GAVI Alliance, who help organise and run the clinic. This is a digital postcard sent from TeamHonk (www.mammasaurus.co.uk; www.aresidence.co.uk; www.mummybarrow.com ) during their travels with Comic Relief in Ghana celebrating #goodwork. Thanks to Annie, Penny & Tanya for the postcard. Bearing in mind my blog, you can be sure my first question about how to get involved with Red Nose Day this year was “Is there an app for that?” …and what do you know, there is! Post updated 6 February to include postcard. I have lots of happy childhood memories of staying up to watch CR and crying through all the film clips of the work they were doing. I’m sure it had an impact on the path I took. Thanks Fiona! That’s a great question, and one I don’t know the answer to, but would love to find out. #TeamHonk have been blown away by all the support.